The open high truck gives the passengers a filling they can concurred the world. The truck is open so you need to dress accordingly. For food and drinks do not worry everything is on board and the driver is also the chef. 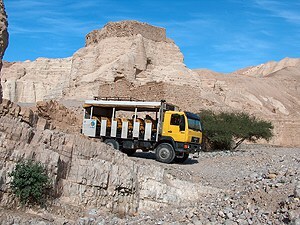 1 day cross Judean desert on a safari truck is a beautiful adventure that takes u from Jerusalem to the Dead Sea. We start from the most beautiful observation in Israel on the Mt. of olives, not fat Mt. Scopus observation where we can fully understand the phenomena called rain shadow. Going down to the lowest place on earth we drive on HWY 1 till Maale Adumuim the biggest settlement in the West Bank and from here we enter the dirt roads crossing the Judean desert. Jabbel Montar (the sentinel in Arabic) is the place where Jews sacrifices the escape goat in biblical time. The highest mountain in Judean desert give us a panoramic view to Jerusalem in the west Dead Sea in the east Herodume in the south and Jericho in the north. Driving down on the steppe cliffs is a daily routine to our experience drivers but give a thrill to all passengers. The highlight of the tour is the observation on the 1,500 years old Marsaba monastery that hng on the Kidron cliffs.